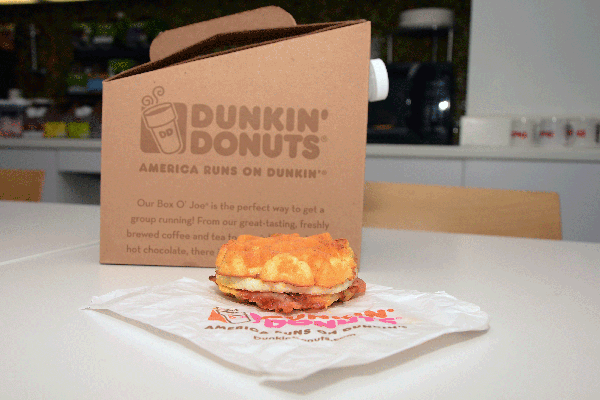 Taste the new egg from Dunkin' Donuts yet? Updated from 1:42 p.m. EDT to include additional details on egg. In a bid to get more business during the competitive breakfast hours, Dunkin' Donuts (DNKN - Get Report) is trying out a new egg-like food for its sandwiches. The company began introducing the enhanced egg product-- which Dunkin' considers new as it contains more egg yolks and egg whites than the prior iteration -- to U.S. locations in early August. TheStreet originally reported the egg overhaul in late July. The new push by Dunkin' to overhaul its eggs comes as its arch rival in the breakfast hours, McDonald's (MCD - Get Report) , continues to promote on TV its use of fresh eggs on the Egg McMuffin. Unlike McDonald's, Dunkin' doesn't have flat top grills in its restaurants, so it's not actually able to cook an egg on the spot. That's why the new egg product contains ingredients that are likely used to preserve its freshness, including (besides egg whites and egg yolks), "Soybean Oil, Water, Unmodified Corn Starch, Salt, Natural Flavor, Xanthan Gum, Cellulose Gum, Citric Acid," according to the company. We tried the waffle breakfast sandwich (below) and can attest to the egg tasting more like a freshly cracked egg. But it still has the rubbery texture and bland taste inherent to many of the synthetic eggs found at fast-food chains. The new egg at Dunkin' tastes more like an egg. A source close to the matter says the new egg has no pepper flakes on it. Additionally, says the source, the egg has no artificial ingredients or flavoring and boasts 50 more calories. According to a company spokeswoman, the egg was well-received in tests with consumers. By year end, Dunkin' also expects to debut a reformulated bagel. "We decided a long time ago it was time to improve the quality of our breakfast sandwiches, so we are giving it more yolk and more egg whites -- the taste is fabulous, you really do notice the difference," Dunkin' Brands Group Chairman and CEO Nigel Travis told TheStreet in an interview. The ingredient improvements come after a mixed second-quarter for Dunkin' in the U.S. amid intense competitive pressures in the fast food space. Dunkin' reported that net sales for the second-quarter rose 2.3% from the prior year to $216.3 million. Analysts expected sales of $220.2 million. Earnings, adjusted for one-time items, gained 14% year over year to 57 cents a share, narrowly beating Wall Street estimates of 56 cents. At Dunkin' U.S., same-store sales rose 0.5%, falling shy of estimates for a 0.9% increase. Same-store sales for the division rose 2% in the first quarter. At Baskin-Robbins U.S., the 31-flavor ice cream chain that has benefited with America's continued infatuation for the sweet treat, sales increased 0.6%. Wall Street estimated a 3.4% increase. Shares of Dunkin' Brands Group have been relatively unchanged over the past year compared to an 11% gain for the S&P 500.